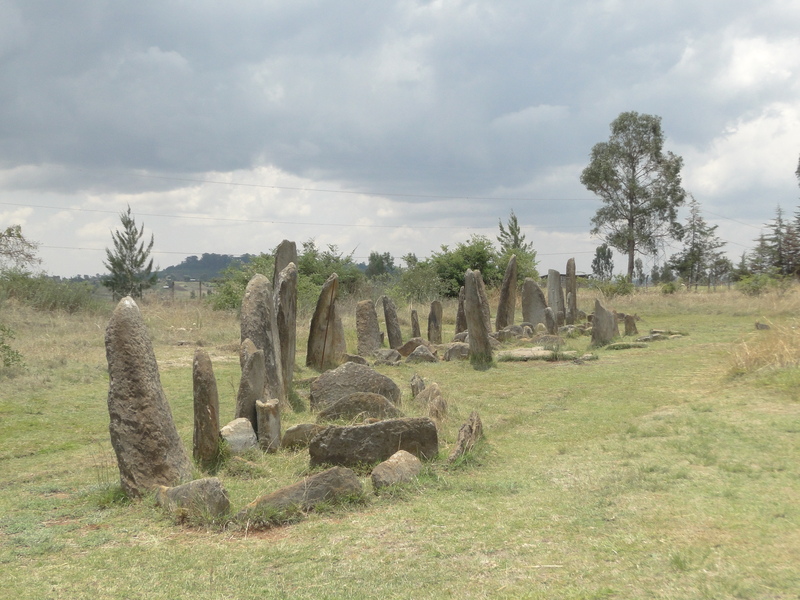 The Tiya Stelae field, about 80 kilometres south of Addis on the Butajira road, is one of Ethiopia’s UNESCO World Heritage sites. It is made of some 41 engraved standing stones somewhat reminiscent of some of the Celtic archeological sites found in Britanny. However, the Tiya funeral stelae are far more recent and more finely engraved than their European counterparts. Being only half an hour further south than the church of Adadi Mariam, visitors usually go on a day trip to see both sites. The day I took my mother and her friend to Adadi Mariam (see previous post), I decided not to extend the trip to Tiya as I thought (rightly) that they would have had enough with one site. In terms of sightseeing, the Tiya field is relatively limited so in my view it is best to stop there on the way to Langano or Arba Minch. The site is just off the main road, so it is very accessible for a short 30 minutes break. We stopped there on the way back from lake Langano where we had a long family weekend a few weeks ago. My children were quite reluctant to go to Langano in the first place, but went anyway after a bit of negotiation (I forgot what it involved), so when I told them that we would stop in Tiya on the way back, they vehemently protested. At the site, they refused to get out of the car, so we went by ourselves and left them sulking (the site is relatively small so they were never out of sight). We had arrived just before midday, everything looked closed, including the little office and what seemed to be a souvenir stall. We started walking around the field when a young man came running towards us, explaining that he was the official site guide and that we would have to purchase our entry ticket before he could take us around the field. So we did and he gave us a brief explanation, while our children were giving me very angry looks. Very little is known about the origins of the Tiya stelae. It is believed that the site was a mass grave dating from the 12th-14th century, where people aged 18 to 30 years old were buried in a foetal position. The site was already known in the 1930s, but was further excavated about three decades ago by French archeologist and scholar, Roger Joussaume, an expert in megalithic monuments, and was consequently declared a World Heritage site. The stones are divided into three groups depending on their style of engravings and are between 1 and 5 metres high. Their very stylised drawings speak about the achievements in their lifetime of the people they represent, in particular the number of ennemies they killed which are symbolised by a sword. So four swords carved on a stele means that the deceased had killed four enemies. Some of the engravings are more abstract with shapes such as semi-circles and inverted cones, supposedly representing a woman. 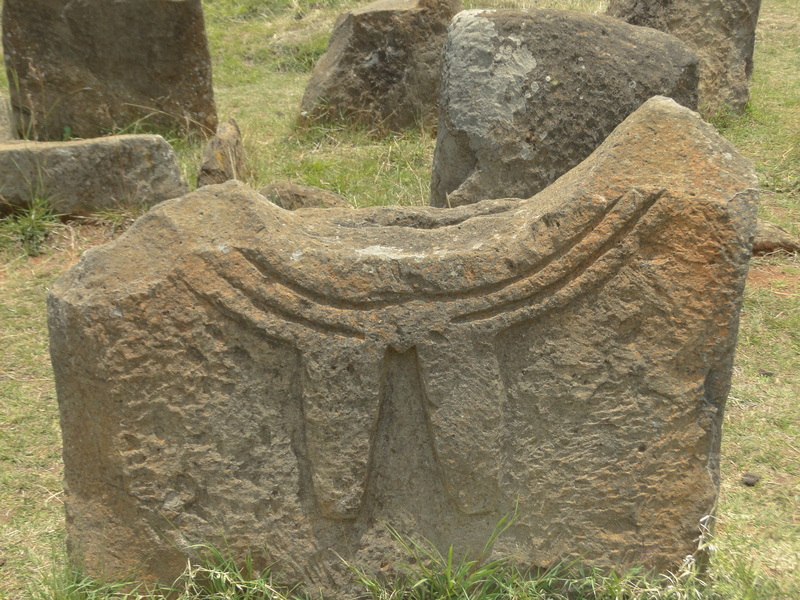 According to our guide, other smaller stelae clusters found in the region between Soddo and Awassa are linked to Tiya, but Tiya remains the most important one. Next to the stelae field, a small museum has opened showing pictures of the excavation work and some artefacts found on site. However, the explanations are still quite basic. More research is probably needed to get a better understanding of the place. After that short interlude, we made our way back to the car to return to Addis. Needless to say that my children didn’t say a word to me all the way back home. 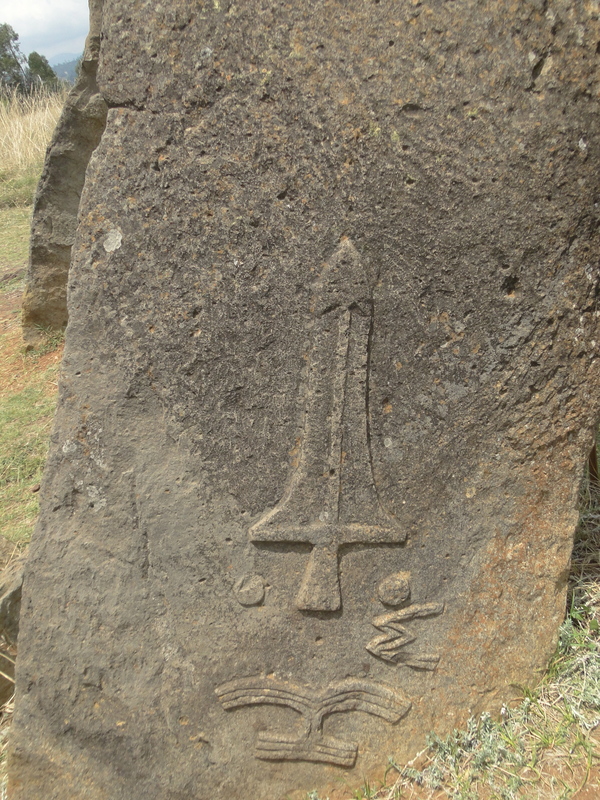 This entry was posted on June 8, 2014 by Salambo in Tiya stelae field, Travelling outside Addis and tagged Addis Ababa, Butajira road, Ethiopia, funeral stelae, megalithic monuments, symbolic engravings, Tiya stelae field.